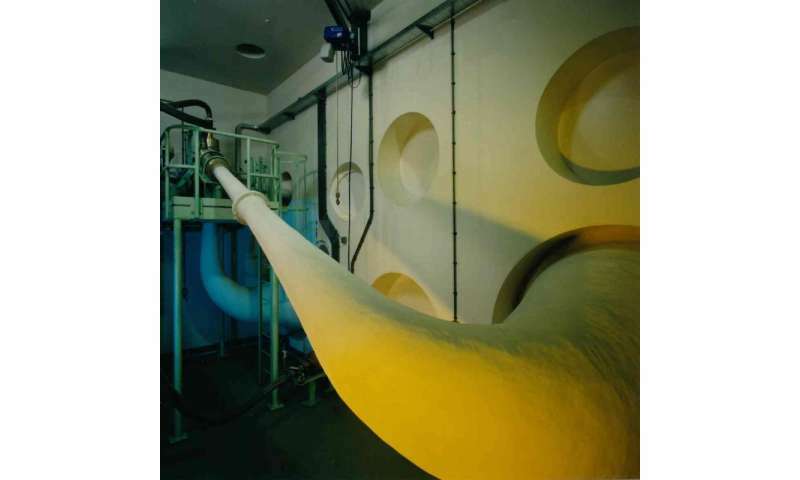 The largest sound horn feeding into ESA's Large European Acoustic Facility – seen here during its installation in 1990 – which is used to subject satellites to a noise level equivalent to a rocket launch. LEAF is an integral part of ESA's ESTEC test centre in Noordwijk, the Netherlands, a collection of spaceflight simulation facilities under a single roof. One wall of the chamber – which stands 11 m wide, 9 m deep and 16.4 m high – is embedded with a set of enormous sound horns. Nitrogen shot through the horns can produce a range of noise up to more than 154 decibels, like standing close to multiple jets taking off. As a safety feature, LEAF can operate only once all the doors are closed. Steel-reinforced concrete walls safely contain its noise, coated with epoxy resin to reflect noise to produce a uniform sound field within the chamber. The chamber itself is supported on rubber bearing pads to isolate it from its surroundings.